Vendido y enviado por Gentle Star. Hecho de material de cristal Tritan; non-lead compuesta de óxido de titanio y óxido de circonio. Tritan es un mundo amplia patentado proceso de fabricación y material de cristal; 2 proceso paso con tallos de cristal soplado Tritan Crystal cuencos y prensado. Completamente lavavajillas; no fuerza cuenco herméticamente más lavavajillas accesorio de sujetadores. si lavar a mano o secado, no Twist tallo y cuenco sujetando uno o el otro herméticamente. Ordered this on a previous occasion and love this product. However, in June 2018 I ordered another set and received "Design & Value" instead of Schott Zwiesel. This appears to be the lower-end restaurant supply version of the same glass. Compared to the ones I already had, the clarity of the glass and overall quality seemed lower, plus the base lacked the Schott Zwiesel watermark. Amazon sent me a replacement, but it was the exact same wrong product. Won't be ordering these off Amazon anymore. 5,0 de 5 estrellasHard to believe they can survive! It's really rare to find an item that is exactly as advertised, and when one comes along, it's such a happy surprise! There was a video that showed some of the knocks these crystal glass stemware pieces could take, and frankly it was unbelievable. But I ordered these anyway. It turns out, the ones we got have tipped over and hit our gas stove iron grates, rolled into our porcelain sink, and have laid over on our granite counters. We are not klutzes or a band of rodeo clowns. We have a family of teenagers who do their share of the "chores" including clearing the table and cleaning the kitchen. These have been used for everything from water glasses to "emergency" milk glasses, to the occasional treat of a glass of wine with dinner for my husband and myself, but the glasses get used......... daily. They take the knocks that were advertised on the video. All the glasses have survived so far (which is a record in our house), and there are no chips, scratches, and remarkably no breakage. I'm not saying run out and bounce these all over the kitchen, but as they do tip over, they stunningly seem to survive. The item is not as described. 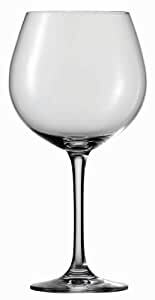 The item is listed as Schott Zwiesel Tritian Crystal but it is actually D&V (I believe that D&V is a budget brand under the same company as Schott Zwiesel). The quality of the glasses is fair (some imperfections and inclusions in the glass). The glasses have a hefty weight but they are not nearly as high quality as Schott Zwiesel glassware. I love(d) these glasses so much that I gift them to friends because I “thought” they made the best gifts.... until last night. Contrary to their claim, these glasses ARE breakable. We were proudly going to show off their best feature to our friends by clinking two together to demonstrate how amazing these glasses are, when one of them shattered. I immediately looked to see if I had accidentally grabbed a Reidel out of the cabinet, but NOPE, it was two Schott Zwiesels. Sooo disappointing. And of course, our return date has passed. I purchased two sets of six champagne flutes for a New Year's Eve get together, for a total of twelve. Before getting to use them the first time, I am already down to nine. I know that glass is fragile, but the fragility of these glasses gives a new definition to the term. One was cracked right out of the box. I gently started placing the rest into warm soapy water (to wash them before the first use). The first two I placed in the water rolled a couple of inches toward each other, and the rims lightly clinked against one another. Both ended up with cracks matching the one that came cracked. I believe in taking care of my things well, and I did not handle these at all roughly. I find it incredible that 25% of them cracked before I even used them. These glasses are very beautiful, but before buying them, please keep in mind that they are extremely fragile. I expect that my (now incomplete) set will serve me with one or two uses before all are broken. At over $8 a glass, I think they should last longer.